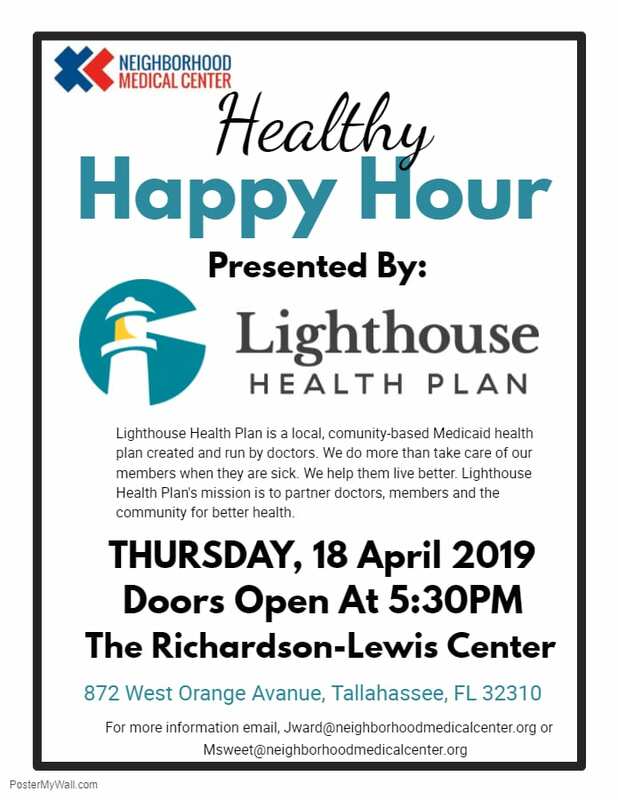 Neighborhood Medical Center will be hosting our monthly Healthy Happy Hour at the Richardson-Lewis Center (872 W. Orange Ave. Tallahassee, FL 32310). This event will take place on Thursday April, 18 2019 from 5:30pm-7:00pm. This month’s Healthy Happy Hour will be presented by Lighthouse Health Plan. Lighthouse Health Plan is a local, community-based Medicaid health plan created and run by doctors. We do more than take care of our members when they are sick. We help them live better. They will be introducing us to their services and health plans they have available. Please come out to help Neighborhood Medical Center and Lighthouse Health Plan spread the word to patients, family, friends, and community members as we learn new ways to empower ourselves and our community.